Whatever Happened to County Cop Who Collided with UFO? 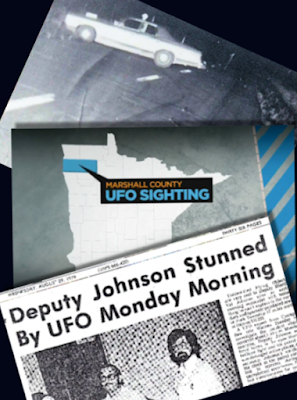 At 1:40 a.m. 36 years ago, Marshall County Sheriff’s Deputy Val Johnson was on night patrol along a rural section of State Highway 220 near Warren, Minn., when he drove into a ball of white light. Johnson drove toward the light, and woke up in the ditch a half-hour later with burns around his eyes. The windshield and one headlight of his 1977 Ford LTD were smashed. Both radio antenna were bent sharply back. The watch on his wrist and the clock on the dash both ticked 14 minutes slow.